(May 11, 2017) -- Having an incarcerated parent takes a heavy toll on children's sleep and eating patterns and can disrupt healthy development, according to new UTSA co-authored research. Published in The Journal of Pediatrics, a new study by Dylan B. Jackson, assistant professor of Criminal Justice with The University of Texas at San Antonio (UTSA) College of Public Policy, and his colleague, Michael Vaughn of Saint Louis University, analyzed data from families involved with the nation's criminal justice system. "Past research has shown that having a parent behind bars can lead to academic difficulties, behavioral problems and illicit drug use in children," said Jackson, a developmental and health criminologist. "The developmental challenges associated with diet and sleep can now also be added to that list of associated risks." In the sample that Jackson and Vaughn studied, 12 percent of the mothers and 46 percent of the fathers had experienced incarceration prior to taking a survey about their children's sleep and eating behaviors. The researchers paid particular attention to the sleep and eating behaviors of kindergartners due to the developmental sensitivity of young children. Children of incarcerated parents are more likely to experience both insufficient sleep and poor nutrition, according to Jackson. The diets of children with incarcerated parents tended to consist of more fast food, sweets, soda and salty snacks, relative to children without a parent in prison. The risks for poor nutrition and sleep were similar whether the incarcerated individual was the mother or the father. 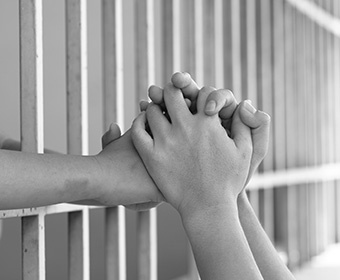 "Children are the often-overlooked collateral consequences of incarceration," Jackson said. "We found that the probability of risky sleep and eating behaviors in children with incarcerated parents is double that of children who have had neither parent incarcerated. This is particularly worrisome, as sufficient sleep and proper eating habits are cornerstones of healthy development in children." Currently, more than 2.3 million adults are incarcerated in the U.S. Approximately one in every 28 American children has a parent in prison, which makes the findings all the more concerning. Jackson and Vaughn say their findings may be of particular use to service providers who come in contact with children whose families are involved with the criminal justice system, such as educators and pediatricians. The researchers suggest that service providers proactively identify children of incarcerated parents and takes steps to ensure they are afforded regular opportunities to eat a healthy meal (particularly at school) and obtain adequate sleep. "We hope that our study can lead to fruitful engagement across policy arenas where the lines between criminal justice, social, public and health policy are blurred," Jackson said. "Our study and findings should make it clear that incarceration impacts not only the parent who is under correctional control, but also has profound and widespread effects on the health and well-being of their offspring."